Today’s bright and cheery card was inspired by colors from the Color My Heart Color Dare #118, and the sketch inspiration was from Case This Sketch #99. The Color Dare palette for the card included colors in Smoothie, Honey, and Olive. 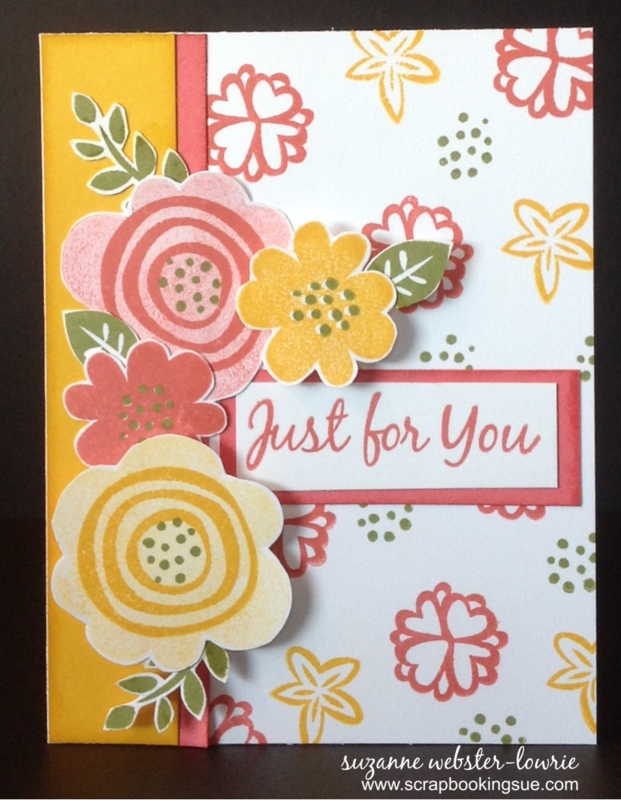 Starting with a 5.5″ x 4.25″ card base in White Daisy cardstock, I random stamped flowers all over the card front. The wonderful stamps used were from the CTMH November Stamp of the Month, “It’s the Little Things.” With 15 images to choose from, it was hard to decide which flowers to use. 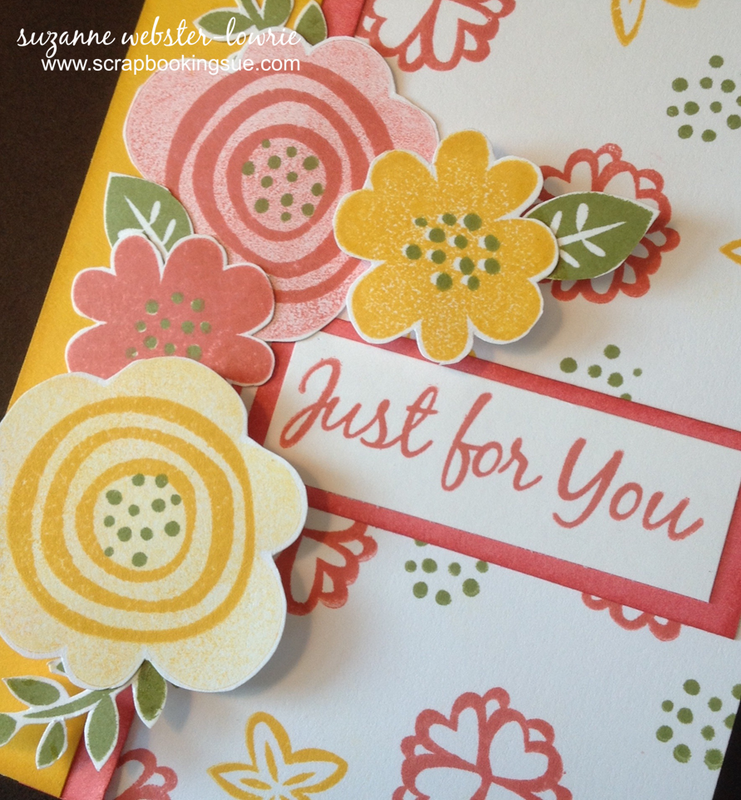 Once the card front was stamped, I added the side borders in Smoothie and Honey cardstock. The large flowers were stamped using the “stamp off” technique, where I inked up the image, made my first stamped impression on a scrap piece of paper, and the second impression (without re-inking) onto my cardstock. This technique created a more subtle version of the intense color. Then, I stamped a swirly image in the same color, on top of the first image. All of the flowers and leaves were fussy cut and adhered to the card. The two Honey colored flowers were popped off the cad with foam tape for some extra dimension. 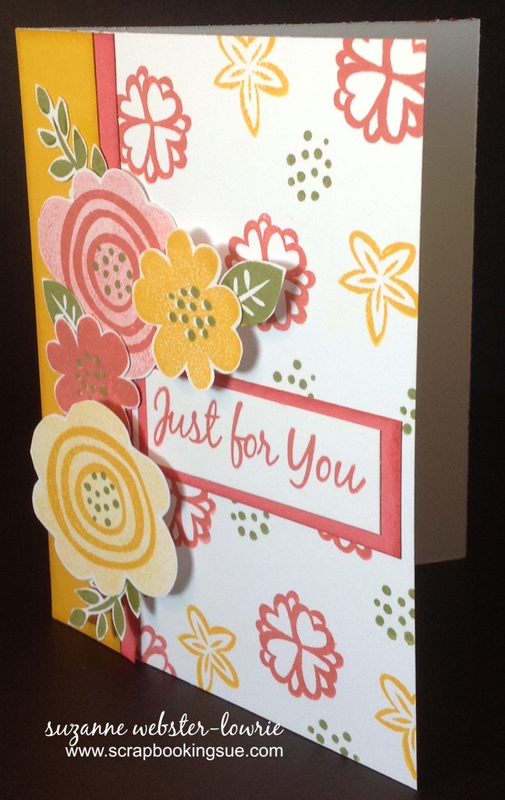 The “Just for You” sentiment was stamped in Smoothie ink and mounted on to Smoothie cardstock to finish the card. Wow…what a beautiful card! I love your random stamping, the layering of the flowers and leaves by the sentiment and the nice clean border down the side of the card. Thank you for inspiring us at Color My Heart Challenge Blog. Thank you so much for the nice compliments, Donna! So pretty! I love those stamped flowers! Great take on the sketch! Wonderfully cheerful card, Sue. These flowers work great as your background and for your cluster! Thanks for joining the Color Dare. Love that pretty, colorful card! Thanks for joining us at Color My Heart Color Dare. Thank you, Peachy! It was fun!